Come Hell or Highwater: Scientists at the California Department of Emergency Services say that major tsunamis (erroneously referred to as "tidal waves") have ripped into California's coastline with regularity every 200 to 500 years. The last one happened 300 years ago. The Big One might not be an earthquake at all. New evidence suggests that a giant wave will swallow coastal California. STACEY HORN, 29, pauses when asked what she knows about tsunamis. It's a sunny day at the Santa Cruz Boardwalk, an area that old tsunami inundation maps blot in as high risk. Girls in bikinis play with a Frisbee on the beach. A boy throws something through the open mouth of a big clown face and wins a stuffed blue poodle. Waves roll gently onto the sand as Stacey bounces a cotton candy-covered three-year-old on her hip. "It's, like, a really big wave, right?" she ventures. Even with the memory of the 1989 Loma Prieta quake still fresh in the minds of many, most Californians remain nonchalant about earthquakes. You can't predict them, after all, you can only be prepared. But how much thought has been given to the prospect of a 100-foot wall of water barreling out of nowhere at 600 miles per hour, dashing homes and businesses over the hill to smithereens? People might think you're talking about the next summer disaster movie. But guess what. "The threat of a tsunami in Northern California is very, very real," says Richard Eisner, coastal regional administrator in the governor's Office of Emergency Services (OES) for Northern California. Valley dwellers, of course, would be safe from such an event, (it would take a 1,800-foot-tall wave to crest over the top of the coastal range). But a tsunami on the coastline could trigger in the entire San Francisco Bay what is known as a "seiche," a seismic wave in an enclosed body of water, which could have devastating effects on shoreline developments in the peninsula and South Bay. A member of the California Tsunami Steering Committee, Eisner is no alarmist, but he is a true believer. He recites chilling statistics with a calm little smile, his thickly bearded face tilted thoughtfully. "It's a threat we are just beginning to understand," he continues about a major tsunami. "Three years ago we were still at the point with most local governments of having to sit down and say, 'OK, this is what a tsunami is, this is what it can do.'" He wants every California coastal town to wake up to the fact that tsunamis are inevitabilities, not probabilities. He knows that, as far as Santa Cruz is concerned, a massive tsunami could make the Loma Prieta quake look like a carnival ride. In the past, complacency towards the tsunami threat resulted from a sense of invulnerability. While the ring of earthquake faults circling the Pacific Ocean makes it prime tsunami territory, researchers had long believed the U.S. coast to be relatively safe. But according to a study published in 1980 conducted by scientists from several disciplines and led by the U.S. Geological Survey, 12 major tsunamis caused by earthquakes of magnitude 8 wreaked havoc on the Pacific coast of North America during the last 6,600 years--an average of every 550 years. New evidence, however, suggests that a major tsunami may strike the West Coast as frequently as every 200 to 500 years--and the last one, according to the historical record, was about 300 years ago. Native American legends recount the devastating tsunami of 1700, as do written records in Japan, where giant waves swallowed entire islands. "It was about 30 meters [98 feet] high," says Eisner, who explains how marine sand deposits have been found far inland in high-up tree hollows. "All along the Oregon and Northern California coasts you see these swamps full of dead trees," he continues. "These trees have been core dated. They all died in 1700, correlating with the dates of the sand deposits, which were carried by powerful waves up onto the coastal bluffs." Doing The Wave: How to keep your head above water. Wet and Wild: Moviemakers have always gotten a kick out of riding the big one. THE CASCADIA Subduction Zone (CSZ) is an area off the coast of the Pacific Northwest where the Juan De Fuca plate dives under the North American plate. It's the largest active fault in North America outside Alaska. While it doesn't produce as many quakes as the San Andreas fault, it is much longer (625 miles) and the quakes it produces are much bigger in magnitude. This kind of thrust fault is the most frequent source of tsunamis. Motivated by the recent findings from the CSZ and by the devastating 1994 tsunami in Japan--which killed over 200 people in spite of a high tech warning system--the U.S. government is taking its first serious look at the tsunami threat. In 1997, Congress set aside $2.3 million to form the National Tsunami Hazard Mitigation Program. Guided by the National Oceanic and Atmospheric Administration (NOAA), the Federal Emergency Management Agency, and the USGS, the program focuses on the needs of the five Pacific states. Each state in turn forms a Tsunami Steering Committee, comprised of directors of Emergency Service offices from each coastal county. Tsunamis occur much less frequently in the Atlantic, because the Atlantic plates are being pulled apart while those in the Pacific are colliding. In essence, the Pacific is shrinking while the Atlantic grows. "There is a great concern that if a tsunami does occur there would be virtually no warning," says Eisner quietly, as the machines in the OES quietly whir all around him. "All the coastal counties of California would be at risk." Once erroneously referred to as tidal waves, tsunamis have nothing to do with tides. Extending from the surface to the bottom of the ocean, tsunamis are actually column-shaped waves that can travel at velocities of up to 600 miles per hour--as fast as a commercial jetliner--in the open ocean. 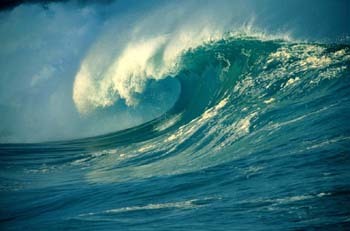 The Japanese word tsunami means "harbor wave," because it passes unnoticed until it reaches the shore. Here it may rear up to heights of 100 feet and surge up to two miles inland. Ships at sea cannot recognize a tsunami as it passes since wave heights only reach a few centimeters in deep ocean. Successive waves may be spaced dozens of minutes apart and continue arriving for hours. Many tsunami fatalities occur after the first wave (which is rarely the largest) when people think it's safe to return to low land. Sometimes it takes days for the sea to return to normal. Conventional thinking on what causes tsunamis has changed significantly in recent years. "We used to think that you only got one with a thrust-fault earthquake, which is where the seabed either lifts or drops," Eisner says. "But recently we've seen tsunamis caused by very minor earthquakes that trigger landslides. We are also seeing tsunamis caused by strike-slip earthquakes, like the one you would have on the San Andreas fault. We're learning a lot more and it's not reassuring. We're learning that we're at greater risk than we thought." In 1979, a submarine landslide in the Mediterranean caused a tsunami that struck the French Riviera without warning. The sea retreated 975 feet before rushing back in the form of two 32-foot-high waves. Six died and three were reported missing along the 37 miles of effected coastline. It was what scientists refer to as a "near-source tsunami." Sometimes, the only indication of such a tsunami comes when water recedes quickly from the shore. The first wave hits within minutes, allowing no time for any kind of official warning. Near-source tsunamis are accompanied by ground-shaking, which, if severe enough, can cause evacuation routes to become blocked by debris. This would be the kind of tsunami produced by the Cascadia Subduction Zone. A local government planning book put out by the Tsunami Steering Committee last month states: "Automated warnings can take up to 15 to 20 minutes to issue, and cannot protect coastal inhabitants located in the immediate area of a near-source tsunami. When a large subduction zone earthquake occurs nearby, the first tsunami waves may reach coastal communities within minutes of the event." While earthquakes are the most common cause of tsunamis, volcanic eruptions and even meteorites have accounted for some--enough for Erik Asphaug, an asteroid researcher at UC-Santa Cruz, to devote himself to the study of tsunami-causing asteroids. The problem, he says, isn't necessarily the big rocks. "It's the smaller group that is the threat," Asphaug says. "We'll never see them before they hit." 'THE BIGGEST OBSTACLE facing effective tsunami planning right now is that tsunamis are these almost dreamlike occurrences that shock people when they happen but then are quickly forgotten," Eisner explains. "In the U.S., it is especially challenging because we have such a limited written record of these events." California's meager historical records document 81 tsunamis of varying sizes --some as small as 3 feet tall--since 1806. The nature of a tsunami wave is such that speed and the distance traveled, not necessarily height, pose the greatest threat. A tsunami just keeps coming, surging quickly inland, bending parking meters to the ground and erasing structures. Even a 1-foot wave traveling at 60 miles per hour is a force to be reckoned with, especially if it's carrying debris. The most memorable California tsunami was a result of the 1964 Alaskan earthquake, which claimed 16 lives in California alone and caused $20 million in property damage. Hardest hit was Crescent City, where oil storage tanks burned for days. Automobiles were carried as much as 100 feet by the waves and stacked in battered piles or hurled into buildings. Ten died in the town of 3,000, primarily as a result of returning to low land after the first wave instead of waiting for following waves to pass. In 1992 the Cape Mendocino earthquake shocked experts, who had long believed it would take at least two hours for the first tsunami waves to reach California. Though that wave caused no damage, it reached Humboldt Bay in fewer than 20 minutes. The Cape Mendocino region and the coastal areas of Humboldt and Del Norte counties are among the most seismically active areas in the United States. The 1960 Chilean earthquake and tsunami killed more than 2,000 people in that country before spreading to Hawaii, where it killed 61, and Japan, where it took another 122 lives. The tsunami also killed two in the Los Angeles area. Most of the deaths in Chile were not caused by the record-breaking 9.5-magnitude quake, but by the tsunami that followed. Waves rushed inland for more than two miles, causing landslides and wiping out entire villages. Debris left in trees shows that in some places the water was more than 13 feet deep. Coastal land was lowered by eight feet. Tales survive of pregnant women huddling in tree branches all night while the water swirled beneath them. Some, caught by the wave, clutched floating pieces of debris. The dead were found in piles the morning after. The cause? A quake from a subduction zone, similar to the one that lines North America. And this tsunami was actually mild compared to older, almost forgotten tsunamis that occurred in centuries before any kind of warning systems were in place. The Indonesian tsunami of 1883 killed more than 33,000. The Lisbon tsunami of 1755 left 60,000 dead. ONE OF THE MAIN GOALS of the National Tsunami Mitigation Program involves improving the seismic network. Currently the only way tsunamis can be detected is by noting the epicenter of an earthquake and then waiting for characteristic waves to strike a sparse network of tide gauges located throughout the Pacific. The West Coast/Alaska Tsunami Warning Center (WC/ATWC) issues watches and warnings to all five Pacific states. NOAA has described these watches as being based on "indirect and insufficient information." Because data can only be provided after a wave has passed one of the tide gauges, there is no way to predict what wave heights will be at other locations. The result is an unacceptably high false-alarm rate of 75 percent. Crying wolf undermines the credibility of warnings and puts people at risk during evacuation. Part of the answer to this problem will come in the form of a system of deep-ocean tsunami detection buoys. Three prototypes are now being tested in the North Pacific and off Monterey Bay. Strategically located, these buoys have detectors 3 miles long embedded in the ocean floor that can measure a tsunami as it passes. Once in operation, these buoys will revolutionize the current primitive practice of inferring from an earthquake whether a tsunami has been generated and then just waiting for it to arrive. Scientists and disaster officials will actually be able to determine information in real time about the wave as it passes in midocean. "This is a huge advance in technology that will enable us to better understand tsunamis and issue watches and warnings," Eisner says. However, the buoys can't detect near-source tsunamis which can arrive within minutes--not enough time to issue a proper warning even if detectable. Before 1997 few counties were aware of the tsunami threat and most had done little or no tsunami planning. Local governments have to determine their own acceptable level of risk. Many question the efficacy of spending a lot of money preparing for an event that occurs once every few hundred years. Neither hell nor high water, it seems, can keep people from developing prime California coastal land. "Cities that have focused a lot of development along the coast are obviously going to suffer the most from a tsunami," says Eisner. "Towns like Santa Cruz should learn from what happened in Crescent City. In places like Santa Cruz, there is tremendous pressure for development on coastal property, which is of course the area most at risk. Obviously the best solution is simply not to build along coastlines." NANCY CARR GORDON, director of Emergency Services for Santa Cruz County, stares out her office window. The only decoration on her office wall is a poster of a huge computer-enhanced wave ready to crash over the Santa Cruz wharf. It's Gordon's job to worry. It is also her job to tell people to relax. Disasters like tornadoes and hurricanes--the calamities of Alabama, Gordon's home state--don't fascinate her. "Tsunamis are the one thing that always gave me the worst pause," Gordon says, glancing at the monster wave on her wall. "Maybe it's because they don't happen very often. "I don't want to scare people or make them doubt their community," she continues. "Personally, I'd love to have an ocean view. You weigh the risk. I think there's only a couple of states that haven't experienced natural disasters and I'm not sure they're states where you'd want to live anyway." Santa Cruz county records document 12 tsunamis in the last 200 years, most of which were harmless and too small to attract much notice. In 1865, the Sentinel wrote that "high cliffs crumbled into the sea, and the tide rose and fell with convulsive throbs." In 1896, two small waves toppled a sand-bag dike and destroyed festival floats for the Venetian Water Carnival. Reports in 1923 describe waves "dashing and splashing against the bluff." The big one happened in 1946, when 15-foot-high waves drowned a man, pushed cars against houses, scattered boats and terrified townsfolk, especially fishermen who were in the harbor. One of the things that concerns Gordon most about tsunamis is that, unlike forest fires or floods, tsunamis tend to draw curious spectators toward the beach where they are vulnerable to successive waves. She remains strangely confident that even though proper inundation maps do not yet exist, Santa Cruz county is ready for any disaster that may strike. "My greatest fear is what if this happens on a Saturday at 3 pm and there's already traffic gridlock from San Jose and you have to evacuate," says Gordon. "The county is still in the risk assessment phase," she says. "In Washington State they already have public announcements and posted warnings on beaches. Schools have special drills for evacuation." Gordon sees similar action in her county's future. "We don't ahve quite the same risk level in Santa Cruz, still we need to do something. If and when we get new inundation maps, I'll meet with my colleagues here to discuss how best to get the information out." From the July 20-26, 2000 issue of Metro, Silicon Valley's Weekly Newspaper.